This guide will go over some of the known troubleshooting methods and open issues with GrabCAD Print. If your issue is not described here, please contact your 3D printer service provider for immediate assistance. For instructions with a specific feature, use the Search bar to the left to find more information. To request a new feature for GrabCAD Print or this help guide, use the "Give us feedback" link above. If you are having issues with GrabCAD Print, we want to hear from you! Even if you resolve the issue yourself using this guide, please get in touch so we can better understand the problem. If possible, please use the Give Feedback form in the Help menu of GrabCAD Print to describe your issue and include your log files. You can also reach out with the "Give us feedback" link above or email print@grabcad.com. GrabCAD Print has several background processes, any of which might be flagged as malicious by your antivirus software simply because they run in the background. Getting past these messages generally means hitting "Allow" whenever they appear, and preventing means adding GrabCAD Print to the list of approved programs. This process will vary depending on your antivirus. GrabCADPrint.exe - The main application. This may be running several instances. PrinterServiceServerConsole.exe - This maintains the connection between GrabCAD Print and the printers on your network. FDMBuildServiceServerConsole.exe - This handles all operations for FDM printing, including slicing and generating the toolpaths. This may be running several instances. PolyJetService.exe - This handles all operations specific to PolyJet printing, including tray materials and slicing. desktop_mesh_service.exe - This program provides the functionality for Analysis Mode. gc_print_data_service.exe - This program gathers statistics about what generic actions are performed in GCP. It does not gather any information about your files. You can configure this service from File > "System Preferences." VoxelFileCreateUtil.exe - If you have purchased a license for for the Voxel Print Utility, this additional program is installed. gc_print_server.exe - If you are running GrabCAD Print Server, this will be running in the background, along with the Printer Service and Data Service. to the list of approved connections. FDM firmware upgrades are retrieved using passive FTP, requiring only port 21. The connection with the FDM firmware uses port 53742 with TCP protocol. The connection with GrabCAD PolyJet Job Manager uses port 57001 with HTTP protocol. The application is available for download at http://grabcad.com/print and will download an .EXE package installer file when you click "Download GrabCAD Print." If nothing happens after clicking the button, your browser security settings or third-party firewall may be preventing you from downloading .EXE files. Please check those configurations in order to proceed with the download. Once the installer is downloaded, double click the .EXE installer file to start the installation. If the installation fails after a short while, you may not have permissions to install programs on your PC. Right click on the installer and select "Run as administrator" or contact your IT department for assistance. 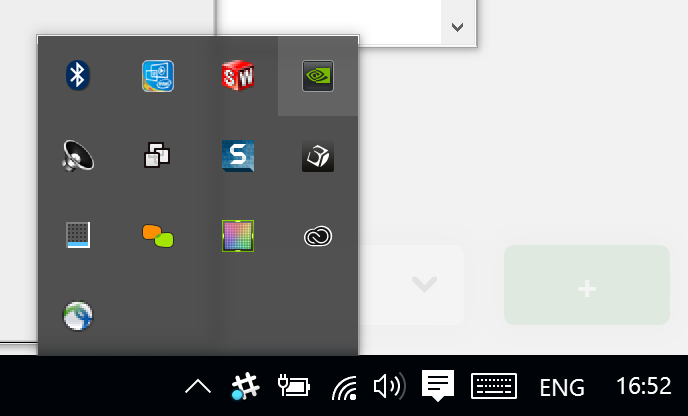 Double clicking the shortcut or launching "GrabCAD Print" from the Start menu should launch the app. If the app does not launch, your antivirus may be blocking the program, however it should appear with a message in this case. If absolutely nothing happens after repeated tries to launch the program, try reinstalling, then contact your IT department or your 3D printer service provider for assistance. In order to log in to GrabCAD Print, you will need a GrabCAD account with access to a company account. Click here to read in detail about signing up. Be sure to check your internet connection. If your PC is not connected to the internet, you will not be able to log in to GrabCAD Print. If you're sure you have everything you need and you still cannot get through the login screen, your firewall may be blocking access to print-api.grabcad.com. Check with your IT department to allow this connection. When a new version of GrabCAD Print is released, the download will begin automatically if/when the application is open. Then, once it's completed the download, the next time the application opens it will install the updates. You can use the "Check for updates" option in the Help menu to monitor this process. If an update is available, it will tell you that the download is either in progress or completed. Once it's completed, restart the application to install the updates. Updates come from api.grabcad.com, so if you are having firewall issues, check with your IT department to add this address to the list of exception. If this process fails for any reason you can get the latest installer here. First uninstall via Windows Control Panel and then install the new version. PolyJet printers require a few extra steps to connect. See this guide for more details: Setting up your PolyJet printers for GrabCAD Print. If you've already gotten your J750 or Objet1000 Plus connected and are having connection issues, try uninstalling and reinstalling the GrabCAD PolyJet Job Manager. It's good to check that the connection between your computer and the printer is working outside of GrabCAD Print. You can do this from the command terminal. Click the Start button and type cmd to bring up the Command Prompt program. Once open, type ping and then your printer's IP address, and then hit Enter. For instance, if your printer's IP is 10.10.14.129 then you would type ping 10.10.14.129 into the terminal. If the connection fails, and you are sure that you have typed the IP address correctly, then ask your IT department for assistance in restoring the connection. Network discovery needs to be on. If your PC is brand new or you just reinstalled Windows, it may be off. 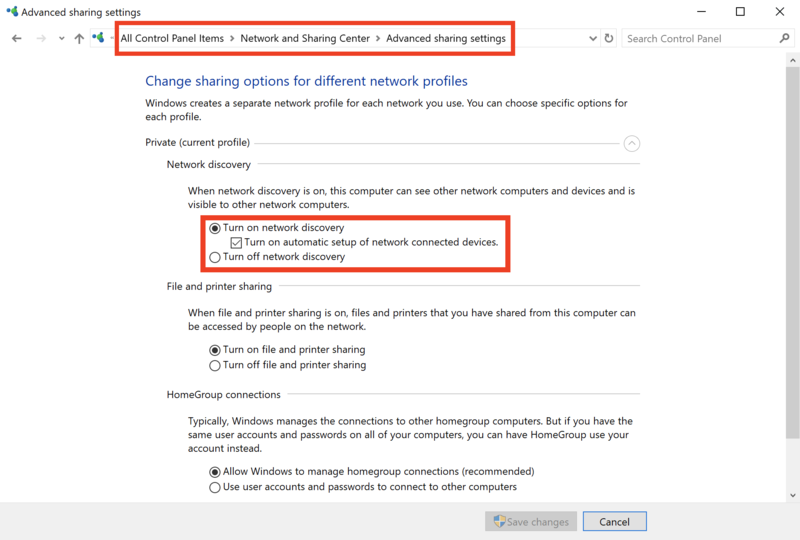 Go to Control Panel > Network And Sharing Center > Advanced sharing settings to enable it. Your antivirus may interfere with GrabCAD Print making any kind of connection with networked devices. Make sure your antivirus is not blocking any of the programs listed above. Your printers may not be discoverable on the network by default. You can first try adding it via IP if UPnP is blocked on the network. To turn on Printer Discovery, go to your printer. In the GUI of the printer, navigate to the settings and enable UPnP. Your printer should now be discoverable on the network if you are on the same subnet. Learn more about connecting to your printers directly or by IP. Computers with 2 network cards may not be able to see printers from both networks. When you connect your computer to a network, you can decide if this network is a Home, Work, or Public network. If you selected public, then printers on your network will not be accessible from your PC. During installation, GrabCAD Print will set up the proper network permissions to access your local network. However, if you changed your network type, these permissions may no longer apply. Click here to figure out how to change your network type in Windows 10, Windows 8/8.1, or Windows 7. Printers that are undiscoverable (turned off or moved to another network) for 14 days will be removed from your printer list. If you see a message saying "An internal error occurred" when trying to add a model, and you see an blank white space in the middle of the application instead of a grey empty tray, then the viewer process has stopped working. If this happens on your first time launching, it is likely that your computer does not support WebGL because your graphics card drivers are out of date. 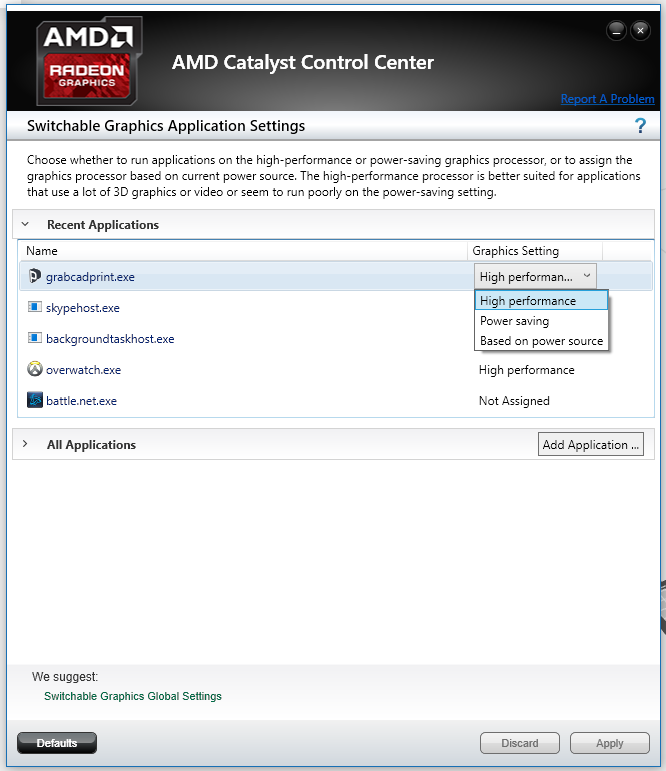 Update your graphics card drivers and restart GrabCAD Print. If your printer is loaded with a combination of materials that are incompatible, jobs cannot be sent. Unfortunately there isn't an informative error message to let you know which materials are causing the conflict, but a common problem is having one of the Digital ABS material and not the other, or a mix of Veroflex and Vero materials. If you see a message saying "PJ service firmware is out of date" whenever you try to connect to a PolyJet printer or template, then something has gone wrong with the background service for PolyJet components. Rebooting or restarting GrabCAD Print should resolve this issue, but if it persists, please contact print@grabcad.com. Large models can generate very large quantities of data, and this can lead to the graphics in GrabCAD Print appearing to be slow and unresponsive. In extreme cases this can even lead to errors being reported by the application, such as "WebGL Context lost." Your computer does not have a dedicated graphics card, and instead uses the main CPU, known as "integrated graphics"
Our system requirements recommend a dedicated graphics card with 8GB of video memory for optimum performance. 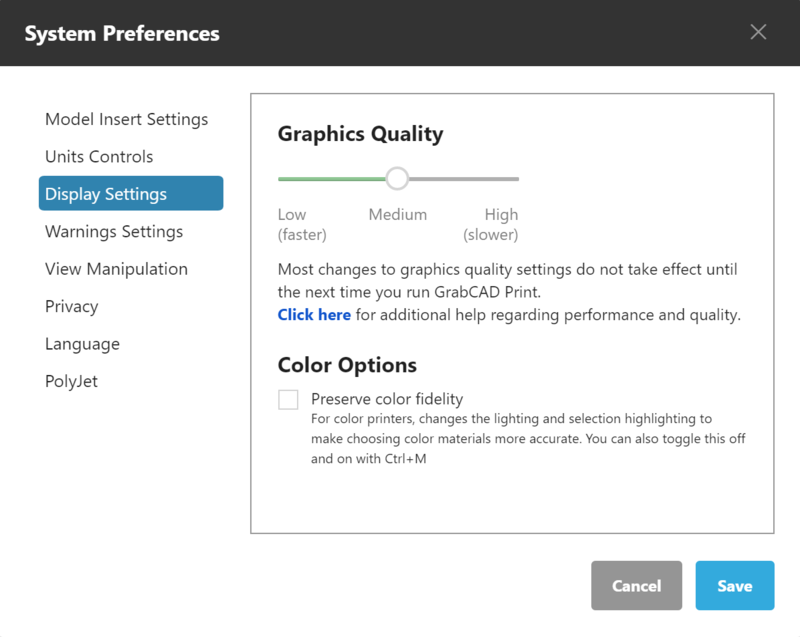 You can configure your graphics setting in GrabCAD Print's System Preferences. Based on available hardware we will choose a default setting, but you can change this at any time. * If you cannot change your viewing mode in Slice Preview, it is because your graphics setting is set to "Low." You must change this to Medium or High in order to use 3D toolpaths. ** Display graphics mesh accuracy controls the number of triangular facets generated for the display of models. Analysis mode, Slice Preview and Accurate compose all work on the fully detailed mesh. The setting does not affect the resolution of printing in any way. Right-click on the GrabCAD Print desktop shortcut and select: Run with Graphics Processor > High Performance. 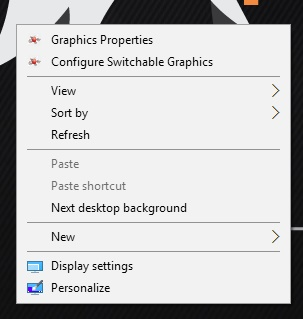 For AMD devices, you can right-click the desktop and choose “Configure Switchable Graphics”. From there it is possible to assign the dedicated card by choosing “high performance” setting for the program. If you experience unexpected print failures, please contact your 3D printer service provider for immediate assistance. If your PolyJet print job stopped without an error message and you cannot resume, it is likely that the Job Manager has encountered a problem. Uninstalling and reinstalling the Job Manager should resolve this issue. Restarting: A background process (even one unrelated to GrabCAD Print) may have encountered an error without showing any signs, and restarting your computer allows these processes to resume normal functionality. Reinstalling: This ensures that all the necessary program files are in the proper locations. Uninstall from the Control Panel (note: this will not wipe your personal settings) then download the latest version and install. Repeat for the GrabCAD PolyJet Job Manager if you are a PolyJet user. There are some files that remain on your system even after you uninstall GrabCAD Print. If your app is not working properly and you have already tried the troubleshooting steps above, you can try a clean installation to see if it helps. 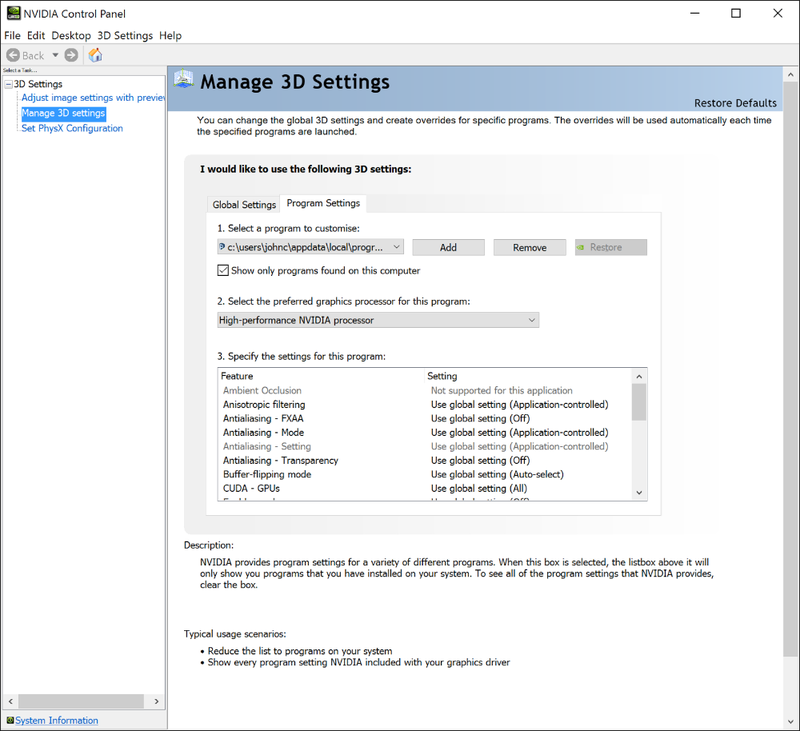 This will clear your printer list, login credentials, preferences, and other configuration files for the various processes of GrabCAD Print.